We work with you to create your one-of-a-kind home. Pete Buzby has a passion for putting people in their dream homes, and the experience to make that a reality. Pete has been working in the home building industry since his teens. At the age of 14, he started working for his uncle’s building company, not only learning the tricks of the trade, but a strong work ethic to go with them. 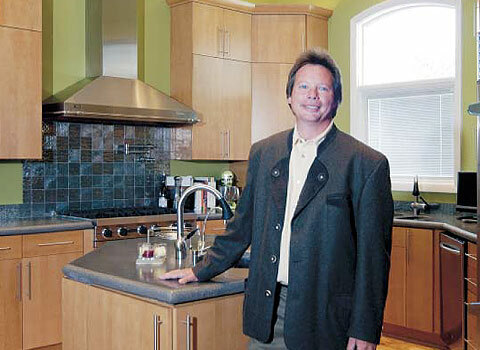 Pete began Buzby Builders out of high school, starting out doing roofing, siding, and modular homes. The business, along with his reputation for quality work and integrity, soon grew. He began to specialize in what he loved –building and designing custom luxury lakefront homes. Pete has a close working relationship with all of his clients from start to finish, and often long after the homes have been built. Many entrust him with their keys, and he’ll look in on their homes when they’re out of town. Keeping things fun is also a big component of his work. He gets a lot of repeat customers and referrals that way. Not only does Pete work in close collaboration with his clients, but he has this same relationship with his subcontractors. Because they all know each other, they all work really well together. This is what allows him to build high-end top quality homes in a short period of time. “When you hire the best you get the best,” Pete says. It is our mission to make that dream home a reality for you. Buzby Builders knows what it takes to build a luxury lakefront home. We know the countless hours of dedication to detail, the passion and creativity in design, and the trust forged between client and builder. Transparency is used in every step of the building process, from full-disclosure cost proposals to final results. Trust is the foundation of every home we build. We invest in a partnership with our clients. A passion for building and design fuels our desire to get every detail right. There is nothing more satisfying than seeing a happy home owner in their dream home. Subscribe to our newsletter and stay updated on the latest developments!